Georgetown Head Coach Patrick Ewing did not mince words after this one, saying, "To me, they beat us on all phases of the game. We were poor defensively. We didn't execute our offense well. We didn't show up. To me, this was one of our worst losses in my two years here. My guys did not come ready to play." 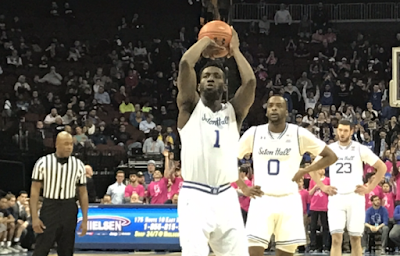 Seton Hall Head Coach Kevin Willard said of his team playing with a double-digit lead, "I can't remember the last time we had a double-digit lead. I think the biggest thing that we've been -- this is the first time we've had back-to-back league games at home all year, and I think the biggest thing was what I've been hammering down over the last three days, four days of practice -- is we've got to come out and be much more aggressive offensively, everybody. I thought Myles Powell -- even though he missed his first three shots -- I thought he came out aggressive shooting the basketball, being aggressive, and I thought that set the tone. I thought everybody picked up off his body language, because that's what he's been doing in practice. He's back to being that guy in practice, and when he comes out and he's that aggressive, it just gives everyone else that much confidence." Willard said of Nzei and Mamukelashvili's performances, "Mikey's been playing phenomenal. We're trying to get him the basketball a little bit more when he has smaller guys on him, because he just has a really good knack at scoring, and Sandro -- he's been frustrating me because he has been playing so well in practice and he hasn't been aggressive in games -- I've been on him, and I thought he came out again, he made his first couple of shots, but I thought he battled Jessie (Govan) really well, I thought he played pick-and-roll defense really well, and I thought he passed the basketball well. I think both of them really -- the way they were playing -- they just weren't going to come out." McKnight had a solid game on offense with 9 points and 9 assists, but he made his mark in this one with his defense against Georgetown's James Akinjo. Willard said of McKnight keeping Akinjo in check, "I thought Q really started the game off defensively -- in our press, he was great. He really worked him. I thought both Myles and him got him out of rhythm a little bit. For a young guard in this league, he's really good. Both him and (Mac) McClung are going to be really special players. I think the league is not going to enjoy those guys over the next couple of years, I can tell you that much, but I thought the way Q came out defensively -- like Myles came out offensively -- really set the tone for us." Willard said of liking where Seton Hall is as a team, "I'd like to see us get a little bit better defensively at certain things, and I need to get our bench involved a little bit more, but that's on me. I have confidence in those guys. It's just sometimes when your starters are playing with as much confidence and playing as well as it is, it's hard to get them in." On Seton Hall's ball movement and efficiency, Willard said, "Again, I just think that's good offensive rhythm. I thought guys were looking for each other, I thought Mike Nzei did a really good job of making himself available, and when Mikey's getting in the lane, slipping, working on the baseline, it kind of opens everything up for everybody."